Mozambican media say 23 people were killed when a vehicle veered into a crowd attending a party in the capital of the southern African nation. Radio Mocambique says the vehicle was traveling at high speed when it hit the crowd early Sunday in Maputo. The radio station describes it as an accident. A senior police official Paulo Langa says the driver of the vehicle ignored a police order to stop just before hitting the party-goers beside a pedestrian bridge on a main road. Radio Mocambique quotes Langa as saying the driver died. Dutch police have shot a man who was shouting ‘Allahu Akbar’ as he tried to attack them with an axe. 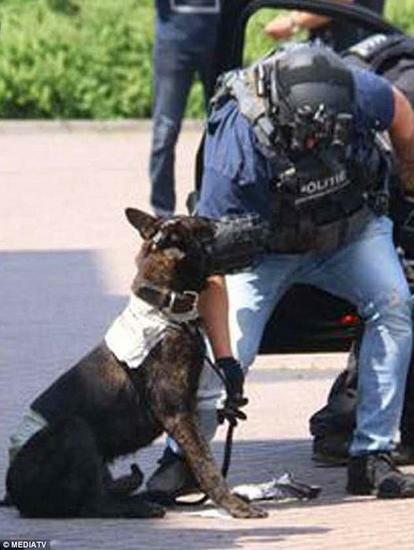 The 26-year-old man was heard screaming the Arabic for 'God is greatest' while waving the weapon and fatally wounded a police dog. SAN FRANCISCO -- A man who told undercover agents that he wanted to carry out a Christmas Day bombing and shooting attack at a popular San Francisco tourist attraction has been handed a 15-year sentence after pleading guilty in a federal case. Everitt Aaron Jameson pleaded guilty in June to attempting to aid a terrorist organization under a plea deal with federal prosecutors. Prosecutors say Jameson, a former tow-truck driver from Modesto, California, told the undercover federal agents that he planned to use pipe bombs to channel victims into part of Pier 39 so he could shoot them. A knife attack which saw two rail passengers and a policeman stabbed by a man shouting 'Allahu Akbar' is being treated as terrorism, Manchester police have said. Anti-terror officers raided the 25-year-old suspect's home in the Cheetham Hill area of the city today as they confirmed two of the victims will be in hospital 'for some time'. Neighbours of the property raided say they believe it is home to a Somali couple and four of their five children, who all moved to the UK from the Netherlands around 12 years ago. Footage of the aftermath of the 'frenzied' attack at Manchester's Victoria Station last night shows a man being pinned down by five police officers, with blood stains on the pavement. The station where the attack unfolded is next to Manchester Arena, where suicide bomber Salman Abedi killed 22 people on May 22. The area was reopened after a cordon was lifted this morning.